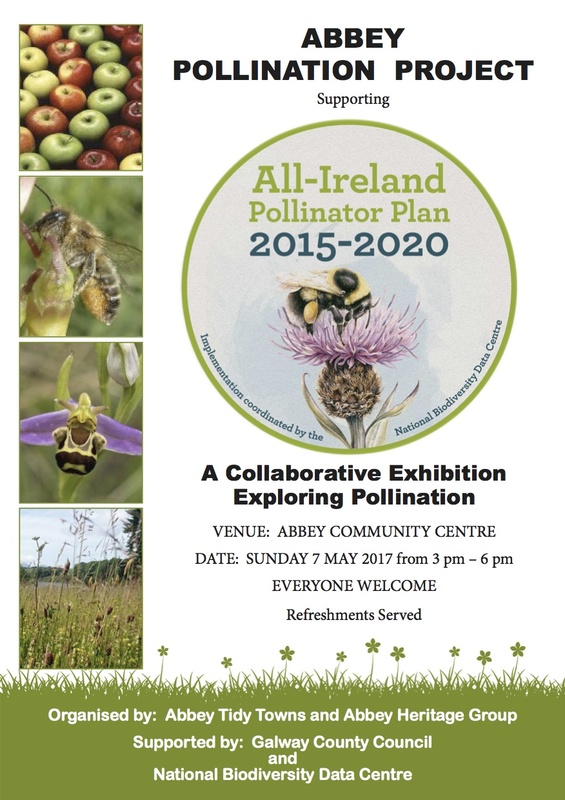 The Abbey Pollination Project – a collaborative exhibition organised by Abbey Heritage and Tidy Towns Groups – took place on Sunday 7th May 2017 at Abbey Community Centre in the village of Abbey. The exhibition, exploring elements of pollination, comprised of talks, creative workshops and contemporary art. The purpose of the exhibition was to illustrate the importance of pollinator species in our gardens and landscapes and to show in a visual and creative way that we can make simple but huge changes in our daily practices to benefit these vital species. The exhibition included a variety of works exploring the area of Pollination and its crucial role in the society in which we live. This work comprised of painting, installation, sculpture and socially-engaged work with local school children and scout groups. The paintings were created in a series of work, based on the seed packets from a large-scale planting plan being implemented this year. The Tidy Towns Group wanted to visually document the variety of flowers chosen with the sole intention of nurturing and attracting pollinator species. The title of the diverse range of works ‘Postcards for Pollination’ invited the declining pollinators to make a return visit to the village as a locus for the study. The project took on a socially engaged aspect through a series of workshops with Abbey National School where school children were asked to create postcards similar to a discover Ireland Campaign asking and inviting the return of the Honey Bee. 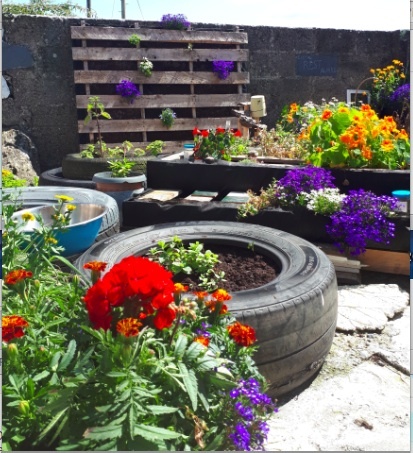 The exhibition extended beyond the venue and out into the community where a ‘pallets for pollination garden’ was created with the help of the scout groups and workers from the community CE Scheme. The Abbey Pollination Project asks the local and wider community to understand the importance of pollinator species in our gardens and in our landscapes. It showed at first hand the very real and positive actions we already take, but also the simple steps we can engage in to further combat the decline in pollinator species. The exhibition was complimented with work developed by the National Biodiversity Data Centre promoting the All-Ireland Pollinator Plan 2015-2020, by the presence of representatives Elaine O’Riordan, Galway County Biodiversity Project Manager, NUI Galway; Community Waters Officer for Galway County Council, Catherine Seale; and Brendan O Toole, area representative of Natural Fertilisation Company, Sobac – a pioneering and effective solution to the problem of mass pesticide use in agriculture and garden practices. Whilst outlining the threats to pollinator species, the Abbey Pollination Project also explored the various and creative solutions to a decline in these species. The presence of local bee-keepers, Brian and Ann Murphy, was a special asset to the event allowing visitors to experience first hand the product of the prolific honeybee in our landscapes. The installation of the blossomed filled apple tree alongside its bare fruitless counterpart was a stark reminder of what would happen should these vigorous pollinators continue to vanish. The Murphy’s provided samples of their wonderful natural honeys and jams all as a direct result of pollination. The organisers of the Abbey Pollination Project would like to thank all who volunteered and contributed to what was a wonderful exhibition and also the near 100 people who attended on a sun-drenched day in Abbey village. Abbey’s pollinator-friendly activities continue throughout the Summer months in Abbey, through continued planting and publicly-engaged projects exploring this vital topic.